The University of Virginia’s extensive manuscript collections on the Cabell family reveal both the quotidian and the sublime. In those moments wherein the Cabells intersect with the story of our state and nation, the documents are electrifying. The everyday events recorded in the letters, memorandum books, and diaries, however, are perhaps even more useful from a historians’ point of view. They reveal the way that the Cabells and their contemporaries lived, from the food that they ate to the manner in which that they traveled. 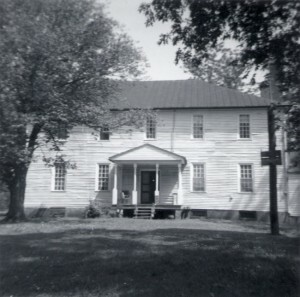 Cabells thoroughly documented virtually every aspect of life at Union Hill—still grand in the 1968 photograph shown below—and even in the slave quarters.